There are seismic changes playing out in British politics at the moment but it doesn’t always feel like that at prime minister’s questions. Today’s battle featured the controversies of the week – like cake, and whether Tory Brexit ministers are getting a slice, as well as the “abject” Autumn Statement – but it was still a prime example of the strange and sober dynamic that exists between Jeremy Corbyn and Theresa May. This was not a bad PMQs from the Labour leader, who pushed the Tories on their disastrous stewardship of the NHS and social care, but there were more details than drama. Brexit came up, as always, but Corbyn’s focus was on health, where Labour strategists believe they have identified both a moral cause and a political prospect. Why was there “not one penny extra for the NHS or social care” in the Autumn Statement, asked an angry Corbyn. He wanted to build on the impetus of Saturday, when Labour staged its largest campaign day outside of a general election. He raised a fair point on the crisis in social care but there is nothing May likes more than turning statistics into a snooze-a-thon and she spied an opportunity here. Some £3.8bn extra is going into the NHS this year and cash for social care is rising – but Labour would not have delivered the extra funding for the health service, the PM claimed. Really – does it feel to you like the NHS is getting better? It rarely does under the Tories and Corbyn knows that. Much of the country understands that too, even though both the current leader and Ed Miliband struggled to turn Tory neglect of the NHS into gains at the ballot box. 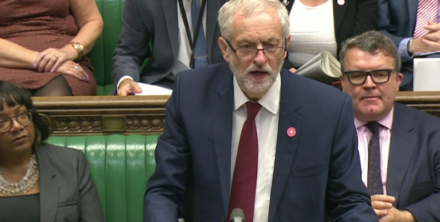 It is one of the subjects that exercises Corbyn, and indeed all Labour MPs, the most. He coupled it with a ringing denunciation of tax cuts for big business and summoned a flash of the crusading anger that helped propel him to the top of the party. “There’s a tragic parallel going on between an under-funded NHS and an under-funded social care system all over the country – and she knows it,” Corbyn said. “On social care right now we have a £1.3bn gap which is not being funded. It is a real crisis in every social services department all over the country – and, indeed, in almost every NHS hospital. It was a stronger moment from Corbyn on a day which, in many ways, seemed particularly leaden. Gone are the theatrics of Miliband’s weekly jousts with David Cameron, when Labour’s anger and anguish at the erosion of public services was set against the then PM’s arrogance and bluster. Corbyn vs May tends to be a more sober affair. There is something to be said for that, like the dwelling on detail, but it lacks the intensity of the exchanges in the last parliament. Perhaps some Labour MPs felt similarly today, because the green benches were not as well stocked as often. The Labour leader traded blows with May over the deficit, which the Tories promised to abolish by 2015, then 2020, before it was “advanced to whenever”. Of course, the PM cannot give any kind of answer, because she was in favour of the Osborne all the way up to the point she changed her mind about it this summer. But tackling the deficit poses political challenges for the anti-austerity Labour leadership: how can you lambast the government for missing its targets for balancing the books without implying they should have made the cuts faster? That was not a worry for today but it shows why Corbyn has had his best moments elsewhere: highlighting the systematic undermining of public services under six years of Tory government. Remember, however, that winning in the chamber, as Ed Miliband often did, does not simply translate to winning in the country. Corbyn’s attack is getting more solid. May is stronger on defence while her barbs against Labour tend to feel… laboured. It makes for a stalemate but shows Corbyn landing his arguments better. A sizeable number of Labour people still oppose the leader but we are united around the fact that on Brexit, the economy and the NHS, the Tories are delivering major changes and at a massive risk to our country.